A single-tablet regimen containing the next-generation non-nucleoside reverse transcriptase inhibitor (NNRTI) doravirine reduced HIV viral load as much as an efavirenz-based co-formulation, but it had a more favourable side-effect profile, according to results from the DRIVE-AHEAD study presentation this week at the 9th International AIDS Society Conference on HIV Science (IAS 2017) in Paris. Current first-line antiretroviral therapy regimens are safe and highly effective. Integrase inhibitors have largely replaced NNRTIs for first-time treatment in recent years, but having multiple potent and well-tolerated drugs from different antiretroviral classes offers more options for individualised therapy. Kathleen Squires of Thomas Jefferson University in Philadelphia presented findings from the phase 3 DRIVE-AHEAD study, which is evaluating a fixed-dose co-formulation of 100mg doravirine, 300mg lamivudine and 300mg tenofovir disoproxil fumarate (TDF). Doravirine, an investigational NNRTI being developed by Merck, has a unique resistance profile and is active against HIV with common NNRTI-resistance mutations including K103N. It can be taken with or without food and has low potential for drug-drug interactions. Previous research showed that doravirine suppressed viral load as much as efavirenz (Sustiva or Stocrin), but with fewer neuropsychiatric side-effects, in a phase 2 study. Doravirine plus two nucleoside reverse transcriptase inhibitors (NRTIs) of the investigator's choice – either TDF/emtricitabine (Truvada) or abacavir/lamivudine (Kivexa or Epzicom) – worked as well as ritonavir-boosted darunavir (Prezista), but with a better lipid profile, in the phase 3 DRIVE-FORWARD study. DRIVE-AHEAD enrolled 728 people starting HIV treatment for the first time. About 85% were men, half were white and the median age was 31 years. The mean baseline CD4 count was approximately 420 cells/mm3, about 22% had a high viral load above 100,000 copies/ml and 14% had a clinical history of AIDS. Participants in this double-blind study were randomly assigned to receive the doravirine combination pill or a coformulation of efavirenz, TDF and emtricitabine (Atripla). To 'blind' the study, because the drugs' dosing regimens are not the same, participants received placebos for the co-formulation they were not taking. Doravirine allows for a more flexible schedule: participants were told to take the doravirine co-formulation or placebo any time they chose – but at the same time each day – with or without food. They were told to take the efavirenz pill or placebo on an empty stomach at bedtime, as this is thought to lessen neurological side-effects. Treatment was planned for 96 weeks, with the primary endpoint being the proportion of people with HIV RNA below 50 copies/ml at week 48. After 48 weeks on treatment, 84% of people in the doravirine arm and 81% in the efavirenz arm had undetectable viral load, showing that the new co-formulation was non-inferior. Those who started with a higher viral load had higher response rates, but these did not differ according to regimen. In a modified analysis, about 90% of those with low baseline viral load and about 80% of those with high baseline viral load reached an undetectable level in both treatment arms. People taking doravirine were more likely to experience protocol-defined virological failure than those taking efavirenz, but this was infrequent in both arms (6 vs 4%). Among participants with virological failure who underwent successful genotypic testing, 1.6% in the doravirine arm and 3.3% in the efavirenz arm had evidence of NNRTI resistance mutations. Both treatment regimens were generally safe and well tolerated, but there were some notable differences in side-effects. Half as many people in the doravirine arm experienced drug-related adverse events overall (31 vs 63%, respectively), but serious events were rare in both arms (1% or less). Less than half as many in the doravirine arm stopped treatment early due to adverse events (3 vs 7%). The most common adverse events in the doravirine arm were headache (13%), diarrhoea (11%), and nasopharyngitis (11%), which occurred at similar rates in the efavirenz arm. Skin rash was less common with doravirine (5 vs 12%). However, doravirine caused significantly fewer central nervous system side-effects. For example, 9% of people taking doravirine reported dizziness, compared with 37% of those taking efavirenz. Looking at a set of pre-defined neuropsychiatric events, half as many doravirine recipients reported sleep disorders or disturbances (12 vs 26%) and altered cognition (4 vs 8%). Depression and suicide or self-injury were also less frequent with doravirine (4 vs 7%). Lipid profiles, too, favoured doravirine. LDL cholesterol, total cholesterol and triglyceride levels decreased slightly after starting treatment in the doravirine arm, while increasing substantially in the efavirenz arm. "Doravirine is a novel, once-daily NNRTI for first-line treatment with consistent efficacy regardless of baseline viral load and favourable tolerability and safety profile in 2 Phase 3 clinical trials," the study investigators concluded. The DRIVE-AHEAD study had some limitations, including the fact that it compared doravirine against efavirenz, which is no longer recommended for first-line therapy in many treatment guidelines due to its adverse events. Nevertheless, its low cost and wide availability mean it is still commonly used in resource-limited countries. In addition, session moderator Monica Gandhi of the University of California at San Francisco School pointed out that the doravirine co-formulation contains TDF instead of the newer tenofovir alafenamide (TAF) formulation, which causes less kidney and bone toxicity. This was done because a generic version of TDF is expected to become available soon, while TAF will remain on patent for another five years or so. Squires K et al. Fixed dose combination of doravirine/lamivudine/TDF is non-inferior to efavirenz/emtricitabine/TDF in treatment-naïve adults with HIV-1 infection: week 48 results of the Phase 3 DRIVE-AHEAD study. 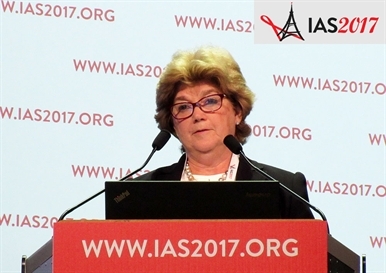 9th International AIDS Society Conference on HIV Science, Paris, abstract TUAB0104LB, July 2017. Download the presentation slides from the conference website. Watch the webcast of this session on YouTube.